Americans who are looking to adopt a child will have several decisions that must be made before continuing through with the process. Adopting a baby can prove to be a very complex, stressful, extended experience that may feel like a lifetime of waiting. A is 4 Adoption is here to provide prospective parents and birth mothers with all of the resources and support they need to create the best possible outcome for the child at the center of the adoption process. Unlike your standard adoption agency in California, our adoption center aims to reduce wait time and simplify the entire process in order to get more children in need into the loving homes they deserve. When you and your significant other decide to adopt, you’ll need to decide on how to proceed. Would you prefer domestic adoption or international? What about the age range that you are looking for? While not as common of a debate now, you can work with closed or open adoptions as well. Today, we’ll look into the differences between public and private adoptions and how each can affect your adoption process. When you’re ready to learn more about how to adopt a child, contact us for help! The concept of public adoption revolves around our foster care system. Children will typically enter this system because they have either been relinquished voluntarily by the parents or ordered by their local court to give the child up. Once this happens, the main goal is to help rehabilitate parents in order to reunite them with their child. If this objective is not feasible in the short term, the Department of Social Services will look toward extended family for support. If no family members can step in to help care for the child, they will be placed into foster care. Children will remain in foster care until their parents are able to step back in or once they reach adulthood. If the decision is made that the child cannot go back to their original family, the goal of rehabilitation is now changed to adoption. Once the goal moves to adopt, the foster care agency will shift gears in order to place the child with a qualified family. Typically, the first option is the foster family, as they have cared for and gotten to know the child. If the foster family refuses the offer, the next step is to reach out and begin finding and interviewing qualified adults. The foster to adopt approach can be beneficial for a few reasons, including the fact that the foster agency will typically offer resources to help with the adoption process. Some parents may even receive a monthly stipend to assist with the financial costs of raising an adopted child. One tradeoff here is the amount of time it may take to complete the adoption. Since the primary purpose is to reunite children with their biological families, the amount of uncertainty and stress associated with this approach can often make private adoptions a preferred choice. Once a family has been paired and the adoption process concludes, a probationary period of sorts will take place to ensure that the new parents are up to the task. This is important for many reasons, the biggest of which being to ensure the safety of the child. Every aspect of foster care (and adoption centers) is tailored for promoting the safety and health of any child that is in the foster care system. While this quality check is vitally important, it does serve to further slow down our snail’s pace of an adoption system. The process of adopting a child can be full of fear and frustration. Birth mothers looking to place their newborn with a strange family may be disappointed with how everything plays out. Adoptive parents may wait months upon months, only to have the entire plan fall through. A is 4 Adoption is here to provide better services than any California adoption agency. Our years of personal and professional experience in the matter helps in our goal of reducing the stress and wait times of those going through the adoption process. 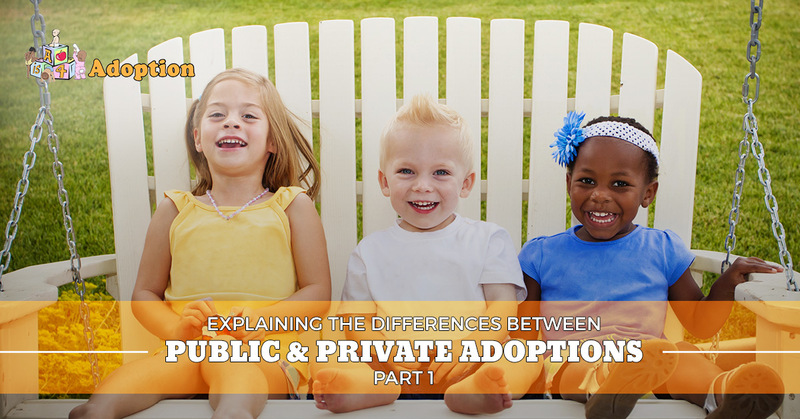 Next time, we’ll look further into the differences between public and private adoptions by looking into the characteristics of your private domestic adoption organization. If you’re looking to adopt, or considering putting your child up for adoption, be sure to contact us today to discuss all that our facilitators can offer!